When you press win+tab, you used to get a sticky view that showed all of the open application windows for each monitor with a miniature picture of the window. As of the 1803 update in May, this view has slightly changed so that view now includes a timeline that you can scroll through rather than just a list. There is also a search box to make it easier to find what you want if you have lots of windows open. 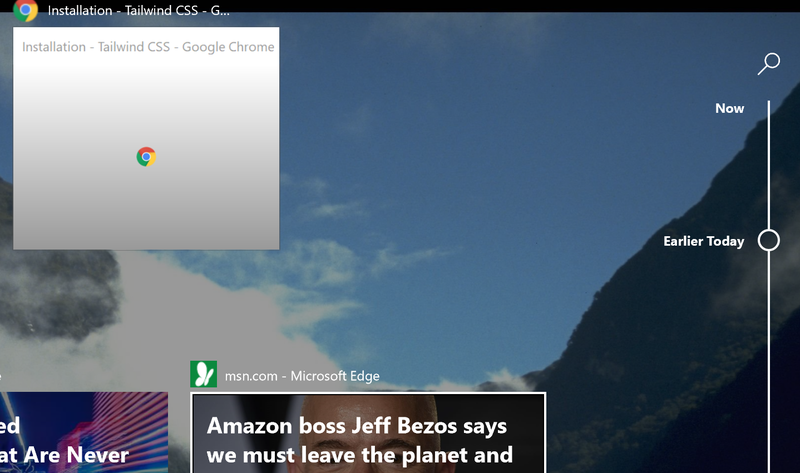 The new view also includes application tabs as well as windows. But only if the application has been adapted. Tabs only show if the application has been altered to make use of the new feature. Currently these mainly seem to be Microsoft applications such as Edge and the Office 365 versions (Click-to-run) of Office applications. Search only works with applications amended to work with it as above. This is especially annoying as it should give a nice way to quickly search through all of the open window titles at least. That information is clearly shown above each window in the list but you can’t search it. Seems like a petty limitation. Windows opened on a secondary monitor for applications not adapted to timeline don’t appear in the main timeline display (on the primary monitor) but applications that have been adapted do appear. This is, in my view, a poor UX decision since it is confusing to people. The search function is only available on the primary monitor even though it searches applications on other monitors (though only if they have been adapted for the timeline as already mentioned). Again, this is unnecessarily confusing to users.